Shelley Pottery pieces can often offer a timeless elegance sometimes overlooked. This super Shelley pottery vase has been decorated with three bands of green with pattern detail to the top band. This vase is very much like an elephants foot or onion in shape – a long stem with bulb at the bottom! On it’s base it has the black printed Shelley England pottery mark dating it c1925 to 1945. Remember…all Shelley pieces currently include FREE UK postage and packaging! 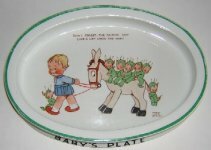 This entry was posted in Shelley and tagged Art Deco, Shelley pottery on January 18, 2010 by Perfect Pieces.